A Terrorist Dry Run Or A DIY Guy With No Brains? A 26-year-old man travelling to Dubai triggered a major airport security scare this week – and a photo of what the scanners turned up shows why. The image looks alarmingly like plastic explosive packed in a mobile phone. Astute staff screening baggage in an X-ray machine at India’s Mangalore Airport spotted it. Reports of the incident circulated in Indian media and were also picked up by UK newspapers. 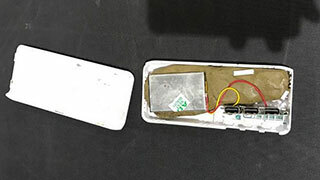 The discovery of the suspicious “clay-like” item in a mobile phone triggered a full alert, and delayed take-off of an IndiGo flight from IXE to DXB. Early reports suggested there was confusion as to whether the device contained explosive, with sniffer dogs giving a “mixed signal.” But police were called and a man was initially detained. Check out the picture though – is that something you would carry on to a plane? It certainly looks suspicious, with red and yellow electrical wires, what appears to be a battery and a brown-coloured, putty-like material. A theory mentioned by the UK newspaper The Sun was that the incident could have been a “dry run” by a “terrorist sales rep” or arms dealer trying to show potential customers how easy it was to get the device through security and onto a plane – in which case the attempt failed. But given that explanation, the pax carrying the phone must have given police an extremely convincing explanation to be allowed to walk free. If that part of the story is true – there are conflicting reports. There may be more to the tale than has been released.